Hope you enjoyed yesterday’s email revisiting the first day pre-convention adventures. Here is a reminder of what took place one year ago today. 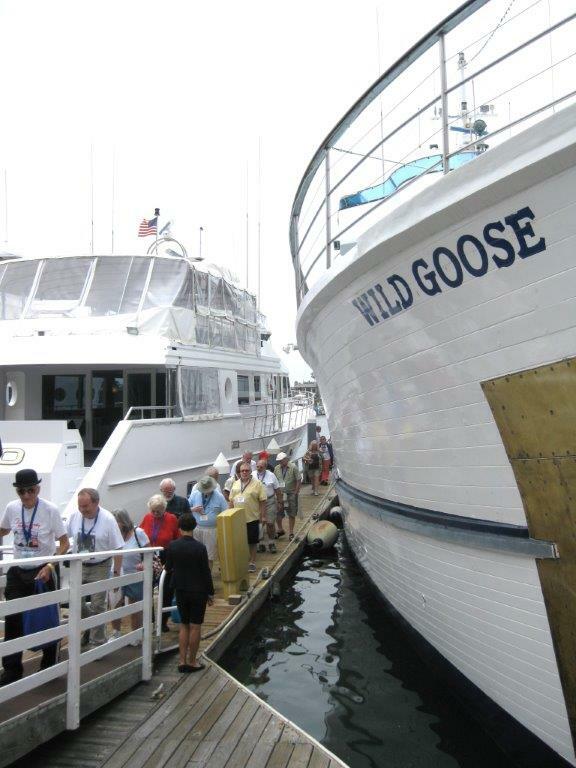 Two buses totaling one hundred members of the Sons of the Desert’s 19th Annual Convention loaded just outside of the Loews Hollywood Hotel and took the hour long trek to Newport Beach where we boarded the Wild Goose, John Wayne’s beloved ship, for a two-hour tour (we try to stay away from those three-hour tours). Sons got to explore the entire ship including the Duke’s bedroom, poker room and “john” (well they don’t call it the Duke). There seemed to be endless hors d’oeuvres and beverages even though we were warned to take only 8 pieces each. 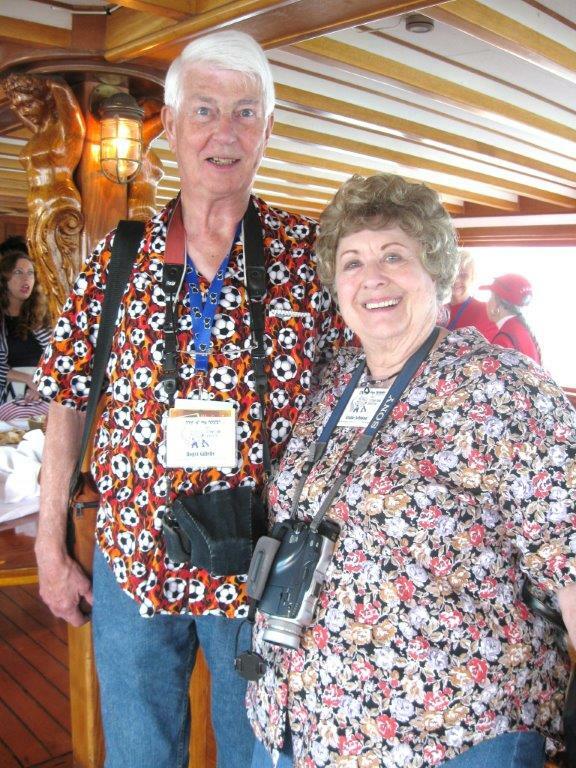 Bud and Priscilla Clark met us on board as this lovely couple lives near by. Priscilla was a member of the Our Gang Comedies and appeared in the classics The Wizard of Oz and It’s A Wonderful Life. 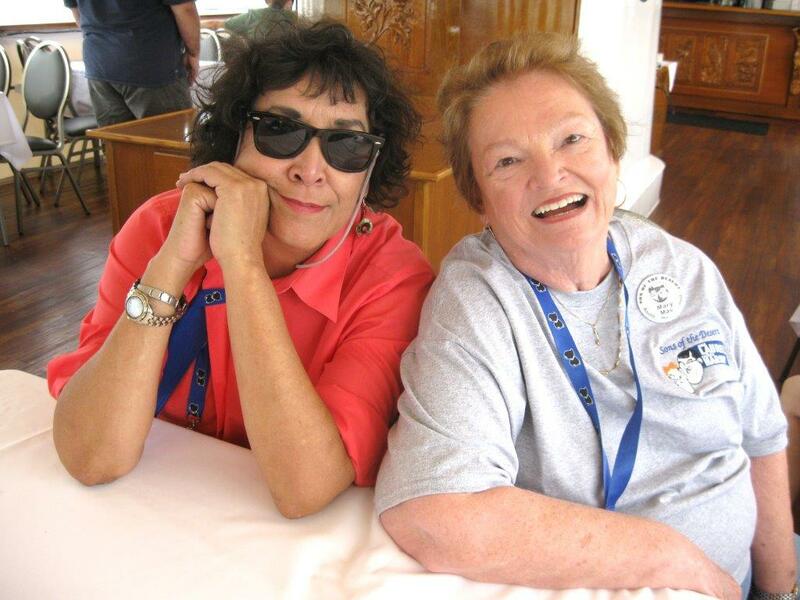 She graciously signed autographs during the cruise. The Captain announced points of interest as we cruise the beautiful Newport Bay including where John Wayne’s mansion used to be. 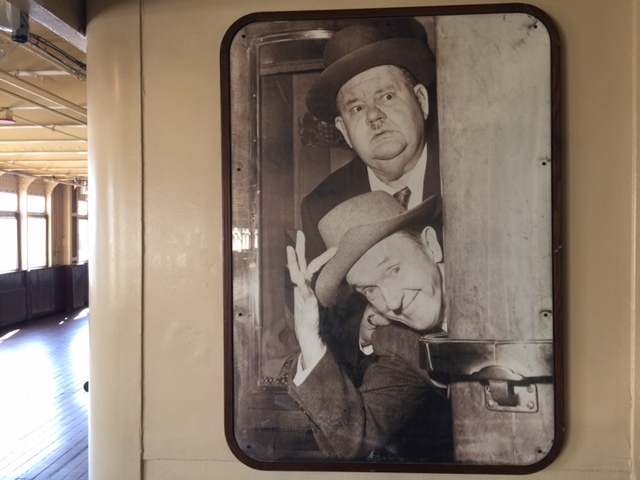 We reboarded our buses and headed to Long Beach where we had a wonderful lunch buffet in the sitting room were Laurel and Hardy would’ve sat after dinner each night during their cruise on board the H.M.S. Queen Mary. 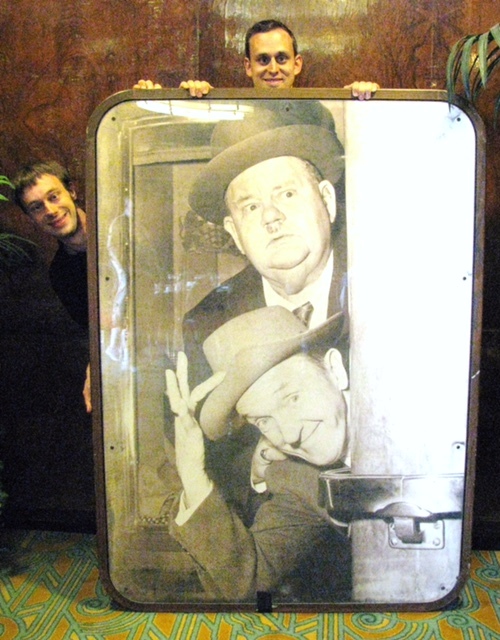 There used to be a picture of Laurel and Hardy from their voyage displayed on the outer deck of the ship along with other such celebrities like Buster Keaton, Bob Hope, Fred Astaire and Spencer Tracy. A few years ago they removed the boys to set up a photo stand in that section and never put them back up. I requested that they drag that picture out of storage and place it out banquet room for pictures, which they did. I stayed on board over night recently and I am happy to report that they replaced the boys right back where they belong on the outer deck. While I stood their taking pictures people walk by call out their names. They are not forgotten! After the wonderful lunch Sons were given a map of the ship and let loose to explore the ship on their own. The Queen Mary was also the filming location for The Poseidon Adventure and about 50 other movies/shows. After the selfie tour we returned to the coaches and headed back to the hotel in Hollywood and opened the registration room for those that could not attend the pre-convention fun! 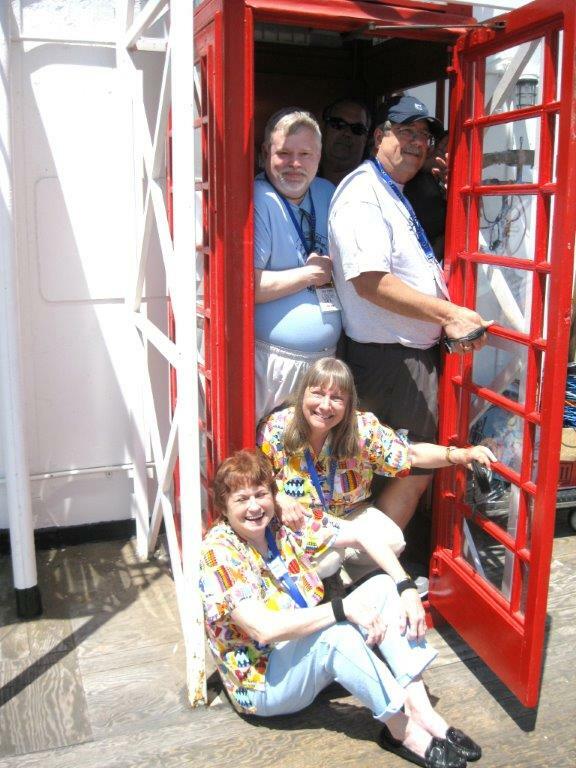 Marcia’s traditional “load the telephone booth” photo (which is getting harder to do since there are so few telephone booths). 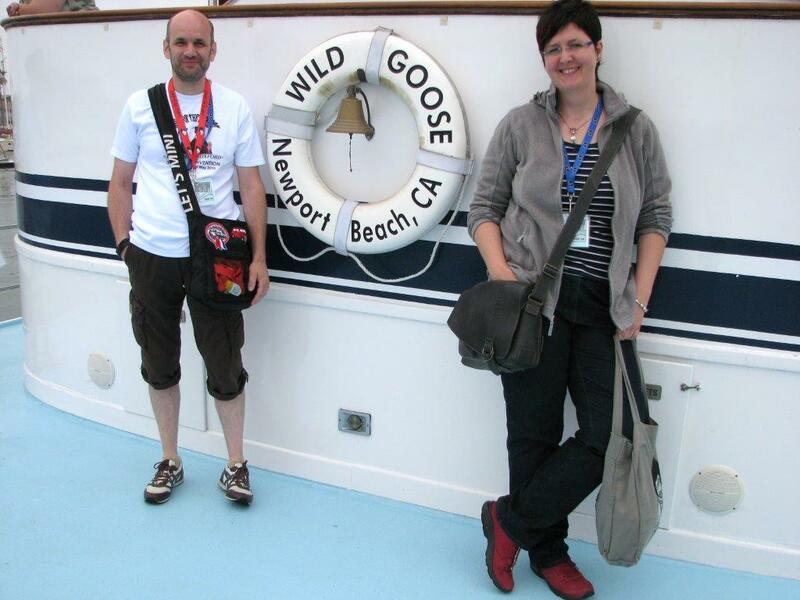 Roger Gillette and the late Elaine Johnson enjoy the comfort of the Wild Goose. 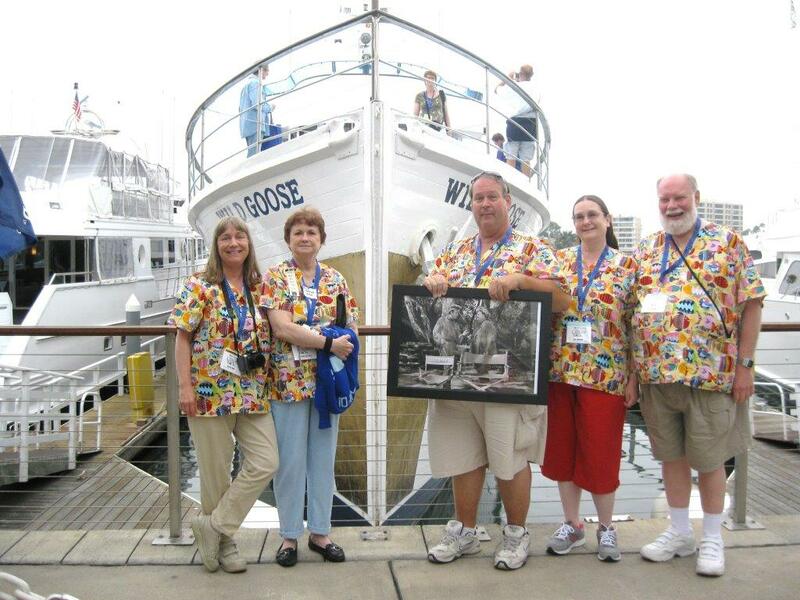 Marcia Opal, Lori Jones McCaffery, me Bob Satterfield, Dee & Lee McBeath show off our matching scrubs with fishes on them and a picture of John Wayne and Oliver Hardy in front of the Wild Goose. Keu Le and his wife pose with a lifesaver. See I told you the Sons took over the ship! 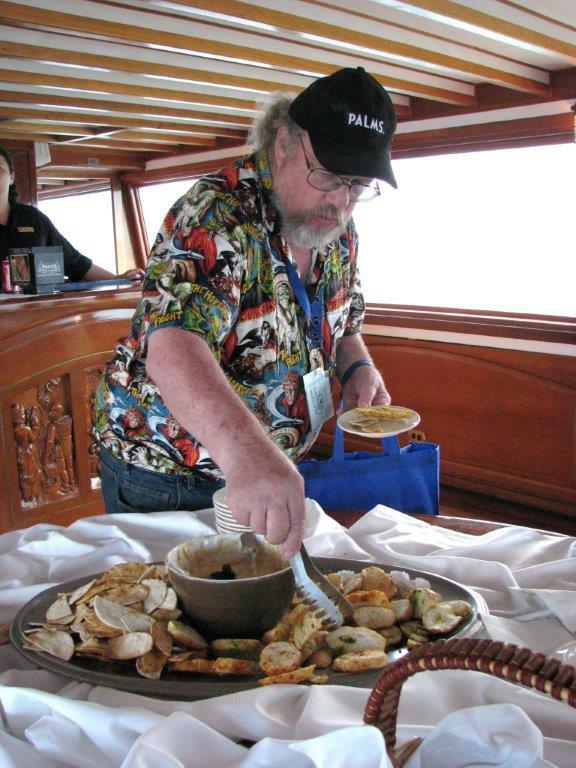 Eric Caidin enjoys the food on the main deck. Eric was the founder of Hollywood Book and Poster and sadly passed away on May 18 of this year. Eric told me after the convention that this was the best convention he had ever been to. It meant so much to me coming from him since he attended so many conventions for so many years. Thanks Eric! Peter and Christian Aberle clown with the Boys. And Stan and Ollie, back where they belong now!